Mayor de Blasio Announces $40 Million in Private Investments to Advance Economic Opportunity for Minority and Women-Owned Businesses and Small Businesses – The Caribbean American Chamber of Commerce and Industry, Inc.
NEW YORK––Mayor Bill de Blasio today announced that three of the City’s designated banks – Amalgamated, Bank of America, and TD Bank – have committed $40 million towards two of the City’s three programs that help minority and women-owned business enterprises (M/WBEs) and small businesses access affordable loans to grow and sustain these businesses. The loan programs, known as the Contract Financing Loan Fund (CFLF) and the Emerging Developer Loan Fund (EDLF), are two financial tools established by the de Blasio Administration to address historic barriers faced by many M/WBEs and small businesses in accessing capital. This additional funding builds on the City’s initial investment of $20 million to both funds. With this new funding, M/WBEs and small businesses will now have access to $60 million in total revolving loan funding, triple the City’s initial investment. “By making an additional $40 million available in affordable loans, these banks are invested in the success of minority and women-owned businesses across the city. These new commitments will help us continue working to overcome the historic barriers that hold back small businesses, especially those run by women and people of color. 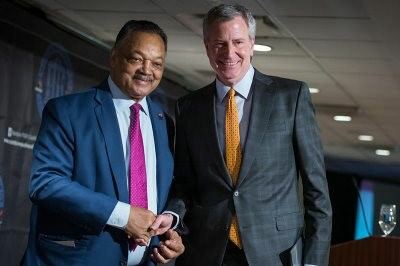 They will now have the capital they need to bid on City contracts and reap the benefits of New York’s growing economy, helping us build a more equitable and fair city,” said Mayor Bill de Blasio. “Every day I climb the steps of City Hall with pride knowing that I get to serve the City I love. But today, I am especially proud to see the public sector and private sector coming together to deliver resources that help create an economy that works for all. I applaud Amalgamated Bank, Bank of America and TD Bank for fostering the entrepreneurial spirit of M/WBEs with their $40 million investment. Today we are proving that New York City is truly the fairest big city in America,” said Richard Buery, Deputy Mayor for Strategic Policy Initiatives and Citywide M/WBE Director. “To combat this affordable housing crisis, we are building a deeper bench of women and minority owned business and development teams. These firms are ready to grow and take on the next big project—they just need some additional support to do it. Our Emerging Developer and Contract Financing funds are crucial pieces of that ‎effort, and we thrilled to welcome Amalgamted, TD Bank and Bank of America as new capital partners helping us reach and grow even more businesses,” said Alicia Glen, Deputy Mayor for Housing and Economic Development. Since launching in 2017, the Contract Financing Loan Fund has provided critical funding for M/WBEs and small businesses contracting with the City. These businesses have had access to $500,000 in loans at a low three-percent interest rate. Access to this affordable financing through the fund has allowed firms to grow and work on over $38.5 million worth of City contracting opportunities. The Department of Small Business Services manages and administers the CFLF. Businesses interested in receiving a contract financing loan can visit nyc.gov/contractfinancing to apply online. A participating lender will follow up with eligible businesses. Participating lenders include BOC Capital, Inc., TruFund Financial Services and Excelsior Growth Fund. The Emerging Developer Loan Fund has, since 2016, provided low-interest loans that range from $100,000 to $2.5 million to emerging developers and M/WBEs. With the addition of $20 million in funding, the EDLF be able to assist emerging developers with 40 new loans that will create $150 million in potential development opportunities, creating an estimated 6,000 jobs over a five-year period. Since 2016, the New York City Economic Development Corporation has approved $6.65 million in loans, allowing businesses to take on over $51.35 million worth of projects. The increase in funding will provide the EDLF with an opportunity to provide funding to projects on its current $42 million pipeline of 40 projects. The NYCEDC manages and administers the EDLF. Interested emerging developers can find more information and apply through the fund’s website at nycedc.com/EDLF. This announcement comes on the heels of unprecedented investments in M/WBEs as well as the enactment of a new State law – Chapter 504 of the Laws of 2017 – that expands the City’s authority to spur economic opportunity for M/WBEs. In Fiscal Year (FY) 2017, the City for the first time in history awarded over $1 billion to M/WBEs. This only encompasses Mayoral agencies. When taking into account non-Mayoral agencies, such as agencies that receive Federal and State funding, the City has award over $6 billion to M/WBEs since the start of the Administration. The Administration, along with elected partners in Albany, advocated for Chapter 504 of the Laws of 2017 which has, among other things, increased the City’s discretionary spending limit for M/WBEs, meaning these businesses are no longer required to first go through a time-consuming, formal bidding process for relatively small contracts for goods and services. The City’s discretionary spending limit is now $150,000 for M/WBEs that offer the City goods or services, up from $20,000 before the Law’s enactment. This increased discretionary spending limit closely matches the State’s $200,000 limit in this area. State Senator Marisol Alcántara and Assembly Member Alicia Hyndman were sponsors of the bill. “I know firsthand the difficulty of securing the necessary financial tools to sustain and grow your business. With the Contract Financing Loan Fund and the Emerging Developer Loan Fund, we are chipping away at the financial barriers faced by countless M/WBEs and small businesses. Today’s $40 million commitment will help continue our work in creating an economy that works for all New Yorkers – regardless of race, gender or ethnicity. Thank you to Amalgamated Bank, Bank of America and TD Bank for delivering these necessary resources that will impact the lives of countless entrepreneurs,” said Jonnel Doris, Senior Advisor and Director of the Mayor’s Office of M/WBE’s. “Minority and Women-Owned Businesses have faced generations of discrimination in government contracting, and as an advocate for pro-MW/BE legislation, I am very pleased that the private sector is joining in partnership with the city to address these historic disparities. It is only through working together as a society that we can rid ourselves of the legacy of racism, and I look forward to continuing to work together with the city to create justice for communities of color,” said State Senator Marisol Alcantara, Chair of Labor. “I welcome the growing commitment of these banks and others who have placed their investments – and their faith – in this important City program that helps minority and women-owned business enterprises. I’m also glad to see a new state law on the books – Chapter 504 of the Laws of 2017 – that expands the City’s authority to spur economic opportunity for M/WBEs. Congratulations to Mayor de Blasio and his administration for creating and pushing this important program for women and minority entrepreneurs,” said Assembly Member Luis Sepulveda. “New York City’s minority and women-owned business enterprises must be positioned not only to compete but to flourish. Since Speaker Johnson gave me the opportunity to Chair the Council’s Contracts Committee, I’ve been committed to exploring innovative ways to help streamline and simplify the procurement process while making sure there’s a level playing field so that our city’s M/WBEs and small businesses can do just that. I commend Amalgamated Bank, Bank of America and TD Bank for putting their money where their mouth is and helping to ensure that all businesses owned and operated by diverse individuals have the chance to win City contracts,” said Council Member Justin Brannan, Chair of the Committee on Contracts. “Working to build capacity among our M/WBEs and small businesses is essential if we are to ensure that the fruits of this City’s economy are enjoyed by all. The Contract Financing Loan Fund and Emerging Developer Loan Fund are aimed at just that – investing in M/WBEs and small businesses to help them perform on lucrative contracts with the City. The additional $40 million investment in these funds will allow an even greater number of firms to overcome the barriers they face, and I commend Amalgamated Bank, Bank of America, and TD Bank for this significant investment in the City’s M/WBEs and small businesses,” said Council Member Robert E. Cornegy. “M/WBEs are an integral part of New York’s economy and spirit. That’s why I’m thrilled to hear of the Mayor’s commitment from three large banks to help them grow and succeed. The prosperity of these local firms is in the best interest of all New Yorkers, and I can’t wait to see where each business will go with this critical support. Expanded access to capital will not only open more doors for people of all backgrounds, allowing individuals and families to realize their small business dreams, it will spur significant job creation – a win-win for our local economy,” said Council Member Helen Rosenthal.